Lionel Messi wins La Liga best player and top goalscorer at Marca awards. 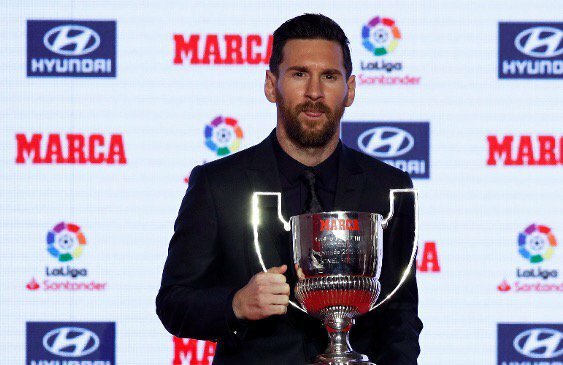 Lionel Messi has said he is relishing the competitiveness of La Liga this season after being named the league’s best player of the 2017-18 campaign by Marca at an awards ceremony in Barcelona on Monday. The 31-year old returned from injury to score twice as Barca were beaten 4-3 at home to Real Betis on Sunday. The Catalans remain top of the table with 24 points from 12 games but are just one point ahead of Sevilla, Atletico Madrid and Alaves. Real Madrid, meanwhile, are sixth with 20 points and just eight points separate Barca and 12th-placed Betis. Messi also picked up the Pichichi Trophy at the ceremony, an award reserved for the top scorer in La Liga each year. His 34 goals in 36 games earned him the prize for the fifth time in his career — only Telmo Zarra, with six, has won it more often. Atletico goalkeeper Jan Oblak was also honoured at the awards as the best goalkeeper in La Liga last season, while there were also prizes for Celta Vigo forward Iago Aspas and Valencia manager Marcelino.